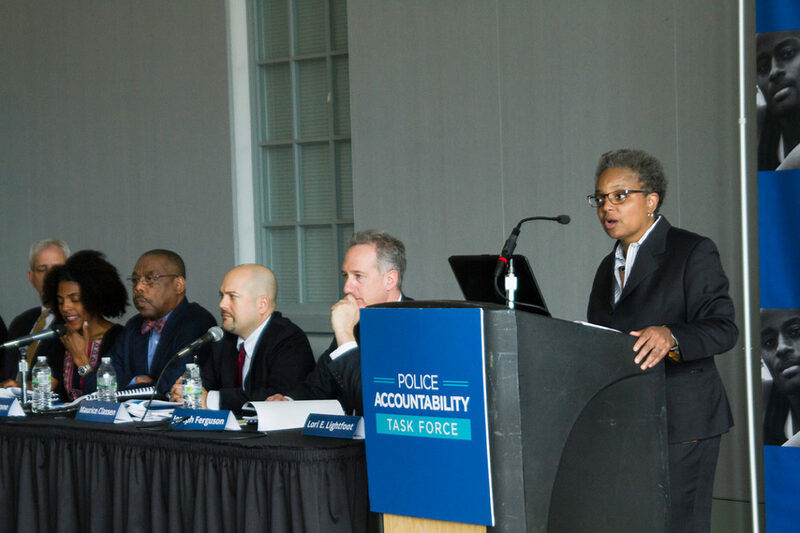 Police Accountability Task Force chair Lori Lightfoot speaks about the findings of the panel's report at the Harold Washington Library on April 13, 2016. A police accountability task force confirmed what communities of color live with daily. A report by Mayor Rahm Emanuel’s hand-picked group called out the nation’s third-largest police department for racism. But the strong acknowledgment of racial discrimination and the clear recommendations in the report, including getting rid of the primary agency that disciplines officers, may be trumped by the mayor’s diminished public credibility. A spoiler alert has hovered over the work of the task force from the beginning: Is the process legitimate, and will the mayor act on the task force’s recommendations? The panel was convened by Emanuel after the release late last year of a video of the police shooting of Laquan McDonald, an African-American teenager. Standing before reporters in a library named for the city’s first black mayor, Lori Lightfoot, the head of the task force, said Wednesday that the report includes many “hard truths,” like the long-simmering resentment between communities of color and police. Following the release of the video late last year, daily protests clogged the streets. The video, the release of which the city opposed, shows a police officer pumping 16 bullets into the teen’s body as it lay in the street. The release instantly catapulted Chicago to the top of a list of cities from Baltimore to Ferguson to Cleveland that have become synonymous with police abuse. Protesters tried to force Emanuel from office, or at the least make his tenure ungovernable. National cable news outlets reported on the city as if it were under a riot watch. The mayor’s response to the attention and the outcry was a mea culpa and a string of “reforms,” including the creation of the task force – one of many the city has convened over the years to examine police abuse. The four-month process of interviewing residents about the police included four often emotional public hearings. Black Lives Matter, which dubbed the task force a “farce,” shut down the last forum. Events surrounding Wednesday’s announcement raised skepticism about the impact of the panel’s work. The group unveiled its recommendations as another police shooting of an African-American teenager made headlines. Sixteen-year-old Pierre Loury was killed Monday near the now infamous Homan Square police site. And hours before the report was released, the City Council unanimously approved the mayor’s pick for police chief, Eddie Johnson, who is African-American. The Police Department veteran didn’t apply for the job. Despite a search process led by the Police Board, which Lightfoot chairs, the mayor dismissed the group’s finalists and advanced Johnson to interim and then permanent superintendent with support from black aldermen. The mayor’s handling of Johnson’s appointment — bypassing an established process — is a bad omen for the adoption of the task force’s recommendations. Many of the recommendations respond to the longstanding complaints in communities of color about structural racism in policing – from disproportionate stops to the use of excessive force. Other recommendations recycle old ideas. A 1972 police commission proposed more independent oversight of Chicago police. The new report proposes replacing the Independent Police Review Authority, which handles the most egregious complaints against officers, with an independent inspector general. The agency’s dismal record was cited in the report: From 2011 to 2015, 40 percent of complaints filed were not investigated. And the report also nods to the agency’s bias in favor of police officers. The task force also took aim at the police union contract, which the City Council approves, for provisions that reinforce the code of silence and protect and perpetuate misconduct. The McDonald case highlights the pernicious power given to officers under the contract. Police officers have up to 24 hours to make a statement after a shooting, and they can confer with other officers, who, in turn, can change their statements. In the McDonald shooting, the statement of the officer who shot the teenager — as well as those of the other officers on the scene — was at odds with what the public saw in the video. They all claimed that McDonald lunged at Officer Jason Van Dyke. None of the officers who backed Van Dyke’s story has been charged. The task force’s support for a “reconciliation process” to help build trust between police and the community may strike a chord in a city where police killed Black Panthers Fred Hampton and Mark Clark in 1969 and where for years disgraced former commander Jon Burge and his midnight crew tortured dozens of people. Lightfoot said other cities have engaged in citywide reconciliation processes. “We think the time is now for Chicago,” she said. The process would begin with the police chief acknowledging the department’s history of racial discrimination. Chicago has had its share of hearings, commissions and recommendations about police practices over the years. Truth-telling could be cathartic for Chicagoans, but only if the mayor, aldermen and the Police Department act on the truth. Asraa Mustufa contributed to this report. Opinions expressed by the editor and publisher are her own. Although Rahm Emanuel is bowing out, the system that conspired to cover up the shooting must still be held accountable.